Expiratory positive airway pressure for sleep apnea goes from humble beginnings to devices with expanded features such as reusability. When physician and engineer Rajiv Doshi’s wife complained about his snoring and asked if he could do something about it, he thought about it for a moment. “Well, maybe that is a reasonable request; maybe I can do something about it,” Doshi recalls thinking. Maybe he could invent a solution. An adjunct professor of medicine at Stanford University, Doshi, MD, thought back to his days in medical school in the ’90s, when he had watched a patient with emphysema do an exercise called pursed lip breathing. The exercise of breathing in through the nose and slowly breathing out through pursed lips helped that patient create backpressure to keep the airways open. When that memory floated back to him, he knew he could invent a device to create that same backpressure to keep his airways open during the night, and hopefully prevent his snoring. It worked. After months of developing and testing a homemade anti-snoring device made from an assortment of supplies, including tubing he picked up at hobby stores and pieces of latex gloves, the first expository positive airway pressure (EPAP) device was born. A venture capitalist at the time with the firm De Novo Ventures, which invests in biotechnology, Doshi had the resources to launch this new product. He also knew that there was a market for treatment solutions for sleep apnea. Many physicians were looking at surgical solutions in the mid-2000s and he wanted to present a less invasive option. So he created the company Ventus Medical in December of 2005 to further develop and sell his EPAP device under the name Provent for the treatment of sleep apnea. The company later released a lower-pressure version called Theravent for snoring. Since then, millions of these devices have been sold, and EPAP has become a well-known therapy among sleep physicians. 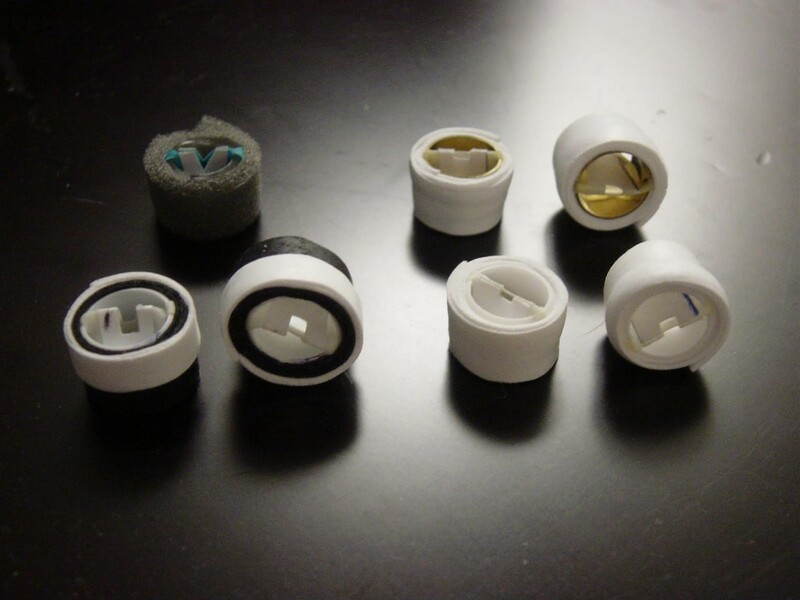 The earliest EPAP therapy prototypes that Rajiv Doshi, MD, made for nasal EPAP in 2005. Doshi used these devices to test the concept of nasal EPAP to treat snoring on himself. Courtesy of Rajiv Doshi. It’s an extraordinarily simple solution, so simple that when it first appeared on the sleep treatment scene, it was met with disbelief, Doshi says. He and his colleagues took on the arduous task of convincing the medical community of the viability and effectiveness of EPAP. Since then, several studies have proven that EPAP is an effective, safe treatment option for patients who might not tolerate CPAP. Research, led by Meir Kryger, MD, showed that patients who used Provent for 3 months had their median apnea-hypopnea index (AHI) decrease from 48.2 to 18.9. Since its inception, EPAP technology has mostly stayed consistent, until now. A few medical companies are redesigning this therapy to focus on increasing patient comfort and creating reusable EPAP devices. One Australian company, Oventus Medical, has even developed an EPAP valve called the ExVent to fit into that company’s O2Vent oral appliance. ExVent is undergoing review at the FDA. The original EPAP device from Provent delivered therapy via the nose and was less tolerated and effective for those individuals who have nasal issues (congestion, anatomical abnormalities) which contributes to mouth breathing says Robyn Woidtke, MSN, RN, RPSGT, director of regulatory and clinical affairs at Oventus. Later this year, AirAvant Medical Inc, is coming out with its new EPAP, the Bongo Rx. Its silicone plugs are inserted inside the nostrils. This device uses the same method to produce backpressure that the original Provent uses, except it dilates the nostrils to further increase airflow, according to Ron Richard, co-founder of AirAvant Medical. The Bongo Rx is a silicone EPAP device. When inserted into the nostrils, the valves will open upon inhalation. Exhaled air flows through small vent holes producing resistance that generates expiratory positive airway pressure. 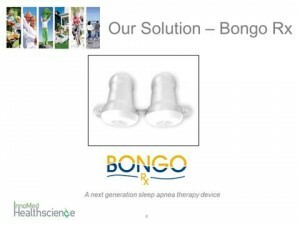 Courtesy of AirAvant Medical Inc.
Last year, the FDA gave the Bongo Rx clearance to treat mild to moderate obstructive sleep apnea after studies showed its efficacy. “Through the studies we found that it really lowers the work of breathing and makes the patients feel much more comfortable,” says Richard. AirAvant Medical’s device is also reusable. The device can be cleaned and worn for up to three months. Made with silicon, it can be washed with mild soap. 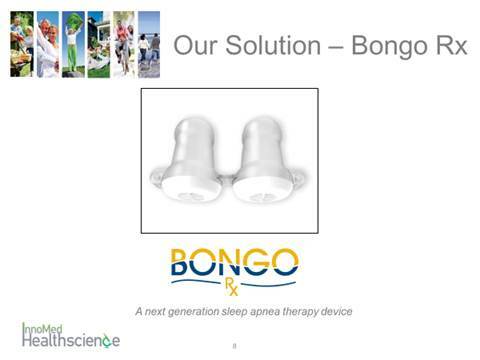 Patients who are congested with a cold or allergies might find this option to be more comfortable than other forms of EPAP, Richard says, since the Bongo Rx is easy to slip in and out of the nose throughout the night. In the future, AirAvant plans to incorporate a built-in monitoring system that will enable patients and doctors to track treatment outcomes, but the technology isn’t quite there yet, says Richard. Berry RB; Kryger MH; Massie CA. A novel nasal expiratory positive airway pressure (EPAP) device for the treatment of obstructive sleep apnea: a randomized controlled trial. SLEEP 2011;34(4):479-485. Previous story Can We Treat Cancer With Circadian Rhythms?